Of all the incredible meals I had throughout the three-and-a-half months I spent backpacking across India and Southeast Asia, I must say that some of my favorites happened to be the first meal of my day. At home, my go-to breakfast usually consists of whatever I had eaten for dinner the night before—typically something savory, always meat-free, and, in the morning, preferably accompanied by an iced latte. That being said, I had no qualms about eating (and zero difficulty finding) mouthwatering snacks to help kickstart my day. Pictured above is an enormous pot of Chinese dumplings—one of my very first morning meals in Bangkok, Thailand. I opted for a selection of the veggie and crab dumplings, although chicken and pork were also thrown in the mix. Doused with a sweet but spicy brown glaze, I had popped them in my mouth using a toothpick as I strolled along the crowded morning markets. Ah, symmetry. Although certainly not savory, nothing wakes me up like fresh, ripe fruit and a cup of coffee. This photograph was taken on my final morning in the incredibly tranquil island of Koh Yao Yai, Thailand. Okay, so the breakfast above is nothing too special. However, under the circumstances, it was exactly what I needed. This photograph was taken halfway through my second week in India at the breathtaking oasis known as Hotel Arya Niwas in Jaipur, India—a stunning renovated haveli with its own vegetarian restaurant. At this point in my trip I had just overcome a debilitating stomach bug, survived the final stages of Indian culture shock, and officially come to terms with the unexpected news that I would be traveling alone for the remainder of my trip. Clutching to my Lonely Planet travel guide for dear life on the sweltering five-hour bus ride from Agra, I was immediately sold after reading that the Arya Niwas had "an extensive terrace facing a soothing expanse of lawn." Grass. Yes, times were that bad. The masala dosa! Ugh, this was one of my favorite things to have for breakfast in India. A traditional south Indian dish, the masala dosa is a crisp vegetarian pancake made from fermented lentil/rice batter that must sit overnight to ensure proper consistency and texture. Once cooked, the dosa is stuffed with spicy, smashed, flavorful potatoes and, in my case, served with coconut chutney and delicious lentils known as sambar. YUM. Again, not a great representation of India's mind-blowingly delicious cuisine, but sometimes you just need a cup of coffee, toast, and oatmeal to remind you of home. However, it was mainly the view from where I enjoyed my breakfast that blew me away that morning. This photo was taken on my second day in Udaipur, India at a beautiful rooftop restaurant that overlooked Lake Pichola. To read more about my dreamlike stay in Udaipur, click here. And for the record, that jam was phenomenal. ...On the road to Mandalay. Pictured above is my first breakfast at a local restaurant in Mandalay, Myanmar. Unsurprisingly, due to the country's recently lifted sanctions and its slow but gradual rise in tourism, most of the menus I read from in Myanmar were written entirely in Burmese. I took a gamble with this one and was not disappointed. Fried dough and chickpeas accompanied by a very, very sweet cup of Nescafe. Oh, Vientiane, Loas… how I miss your sleepy café culture. Everything about Loas was easygoing, from its patient and kind-hearted people to its quiet, late mornings. Due to its strong French influence and developed tourism industry, the Laotian capital is littered with quaint cafés. Although I maintained my (somewhat out of character) schedule-oriented eagerness to get an early start, I did find myself slowing down my mornings in Laos. How could I not? With the smell of fresh croissants and rich coffee streaming out of just about every shop, it was actually difficult not to café-hop the day away. Pictured above is a pain au chocolat, a slice of fresh buttered bread with jam, and, of course, a latte. Pictured above is a steaming bowl of rice soup with fish that I had shared one morning with a fellow traveller in Luang Prabang, Laos. 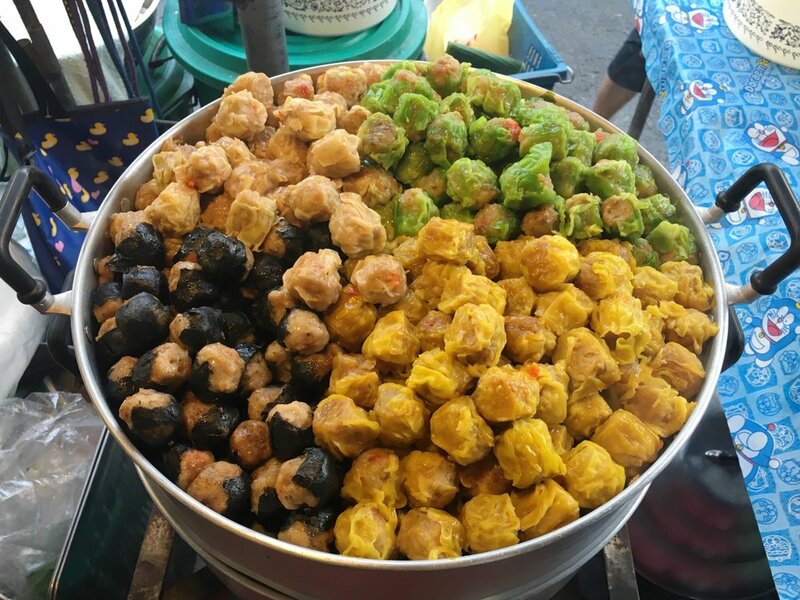 Although the food and produce for sale at the Laotian morning markets were some of the most spectacular I had seen on my travels, my new friend and I were in the mood for a sit-down meal after rising around 4:50am to watch the ceremonial giving of alms to the Buddhist monks walking the quiet streets. Not pictured is the basket of delicious deep-fried bread and hallow doughnuts similar to that of Vietnam's Báhn Quây that I shamelessly dunked and scoffed down. Brunch on the Mekong River, Luang Prabang, Laos. This was a treat (and a splurge in comparison to the $1-$6 meals I typically enjoyed). But ooooh boy, was it worth it!!! My new travel companion and I spent a good five hours eating, chatting, and writing independently at the Silk Road Café at Ock Pop Tok—a beautiful fair trade weaving center and tranquil hotel located right on the river. We started the morning off with cappuccinos, toasted baguette smeared with butter and jam, Silkworm Poo Tea (yep, you heard me), eggs benedict with spinach and smoked salmon, and a glass of ice-cold mulberry juice. And what better way to welcome 3:00pm than with afternoon tea? Next up was an array of home-made cookies, scones, mousses, and finger-sandwiches accompanied by a hot pot of tea. What I wouldn't give for another afternoon on the Mekong River. Vietnam! The land of pho. Seated at a plastic purple table in the Old Quarter of Hanoi, I slurped up a meatless pho bowl garnished with sliced hot peppers and lime. My street-side seating allowed me to be a part of the chaotic morning rush, not to mention gave me prime views of the French and Chinese-influenced architecture that towered above. Sapa, Vietnam. Located in Vietnam's northwestern mountains up by the Chinese border, Sapa is an incredibly serene and overwhelmingly beautiful destination. Photographed here is a cup of lemongrass tea in its simplest form—a lemongrass stalk chopped and steeped in boiling water. After a 10+ hour bus ride from Hanoi and a 5:00am taxi ride through Sapa's winding terraced rice fields, this cup of lemongrass tea was the first thing I had once I reached my home stay. That view though!!! Oh my word. Now this was good. Photographed above is my final breakfast not only in Vietnam, but in Southeast Asia as a whole, as my flight for home was scheduled later that evening. I chose to wrap up my trip on June 20th—the day of my 22nd birthday. In order to properly celebrate my survival I booked my last three days abroad on the beautiful beaches of Hoi An. After joking about the momentous occasion with the owner of my wonderful hotel, I was surprised to learn upon my return from the beach that he had so generously bumped me up to the best suite in the house as a gift. The next morning I rang in 22 with one of the best breakfasts yet: Bánh Xèo. A traditional Vietnamese breakfast, Báhn Xèo is a skillet-fried rice batter pancake stuffed with pork, shrimp, scallions, and bean sprouts. It is often dipped in Nuoc Cham sauce, which consists of fish sauce, garlic, lime, ginger, sugar, and various seasonings. I opted for the vegetarian version and was in absolute heaven, washing it down with black tea and pineapple juice. Perfect birthday. I have to admit, although I had some pretty incredible breakfasts on my trip throughout India and Southeast Asia, perhaps the cheapest and the most accessible, universal, and refreshing was the mango shake. Lucky for me, privately-owned stands selling fresh fruit shakes were everywhere I turned on my travels. Photographed here is my last shake of the trip—savored in Hoi An, Vietnam. Mango shakes were the perfect on-the-go snack that I could rely on to energize my morning… or at least hold me over until I found a more filling morning meal.